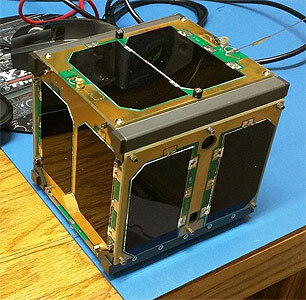 Fox-1E is a radio amateur and technology research cubesat developed by AMSAT and hosting several university developed payloads. Fox-1E is an 1U CubeSat designed to operate in Low Earth Orbit based on the design of Fox 1A. It carries a 2 meter whip antenna and a 70 cm whip antenna. The satellite will carry the RadFxSat 2 radiation effects experiment similar to RadFxSat (Fox-1B) but will study new FinFET technology. Fox-1E will also serve as a communications relay for amateurs worldwide via a new Mode J linear transponder. The transponder is planned to be 30 kHz wide and will also include a 1200 bps BPSK telemetry beacon. The purpose of the project is to test a design for a linear transponder that could be made available to CubeSat builders as a secondary, or even primary, Amateur Radio payload.. The communications and experiment missions will run concurrently. RadFxSat 2 (Fox 1E) was selected in February 2016 by NASA's CubeSat Launch Initiative (CSLI).